In the aftermath of the battle of Waterloo, both the first Duke of Wellington and the battle were to receive many marks of public recognition. Streets, buildings and public places were named after them. The Percy Histories, published in 1823, identified in London 14 places named after Wellington and 10 sites named after Waterloo. When the first portion of what is now called Regent Street was built in 1815-16, it was called Waterloo Place. One of the new bridges built over the Thames between 1813-19 became Waterloo Bridge. London Waterloo Station was opened in 1848 by London and South Western Rail as Waterloo Bridge Station. 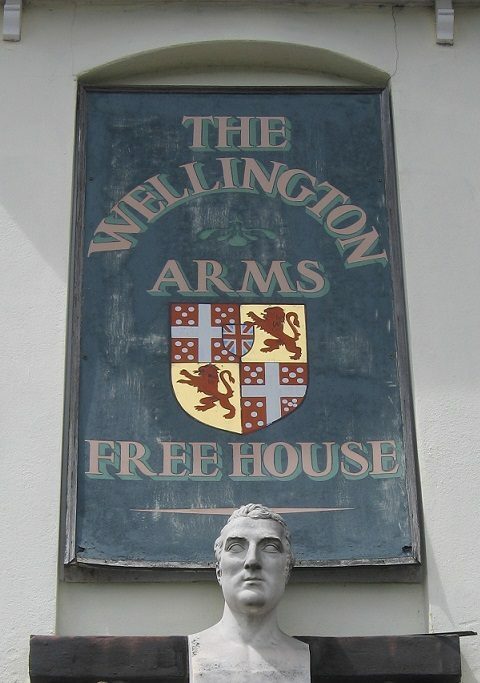 Pubs and inns also were given Wellington’s name, including the hastily renamed Hotel Wellington on the battlefield of Waterloo in 1815, and pubs today continue this tradition. Couples in the nineteenth century chose to name their boys Arthur Wellesley in honour of the Duke, just as children were named after Winston Churchill in a wave of patriotic pride in the aftermath of the Second World War. 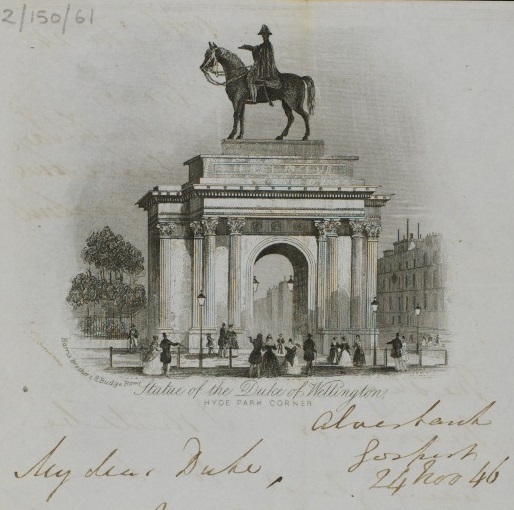 Fêted as the “saviour of Europe”, Wellington received not only honours and funds granted to him by Parliament to purchase an estate, but was the subject of numerous paintings, statues and monuments, such as the Wellington Arch at Hyde Park Corner in London. While his military image was to be tarnished in his lifetime by periods of unpopularity with the general public, there was a great outpouring of grief at his death in 1852. 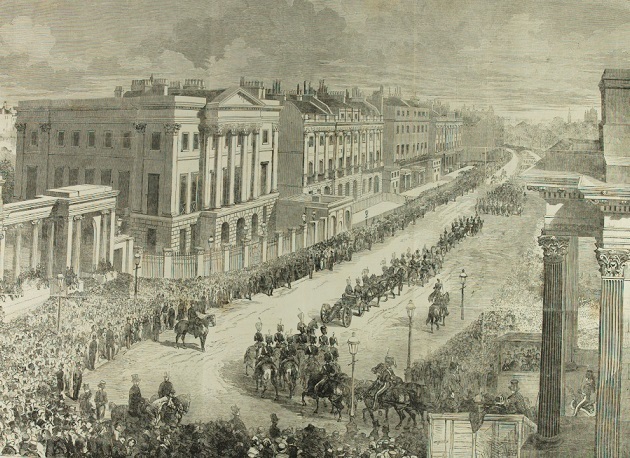 Wellington was rediscovered as a great national hero by the early Victorian public and was accorded a state funeral on a lavish scale attended by massive crowds. For a period he was again elevated to the status he had enjoyed in 1815. The Times wrote in his obituary that “He was the very type and model of the Englishman”, whilst Queen Victoria declared him “the GREATEST man this country ever produced”. The interest in the funeral was great. 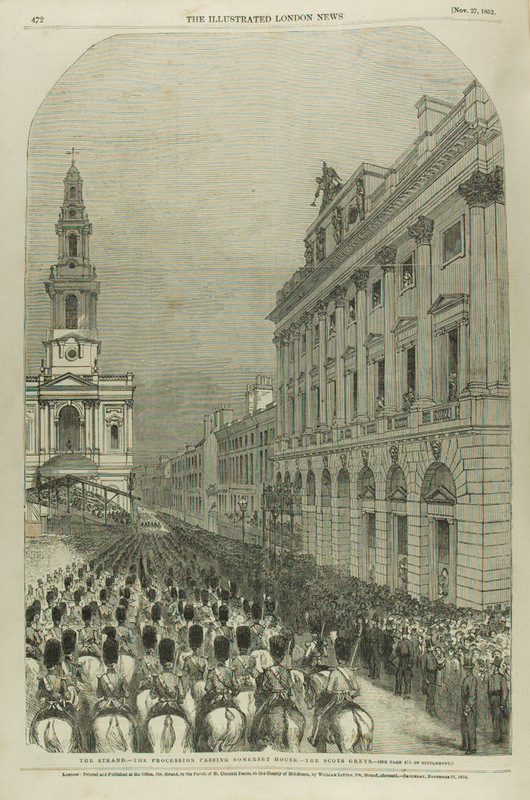 The funeral issues of The Illustrated London News of 20 and 27 November 1852 sold two million copies. There was hardly enough room for those attending the funeral and the whole of the funeral procession route was thronged with people. Shops along the Strand rented out their shopfront, roofs or upper stories. For those who were not able to attend there were memorial services held in churches around Great Britain and at 3pm bells began tolling in every parish church across the country. The outpouring of grief, the discussions on Wellington’s greatness and symbolism as a national hero, that surrounded his death and funeral represented the mythologising of the Duke. Ode on the death of the Duke of Wellington by the Poet Laureate, Tennyson, which appeared two days before the funeral, commemorated Wellington as the “greatest Englishman”, “as great on land” as Nelson was a commander at sea and the “foremost captain of his time”. The first edition of 10,000 copies of this were sold at one shilling a piece and sold out very quickly. Other commemorative works produced in this period were to cast Wellington in similar heroic terms – for Thomas Carlyle he was a “Godlike man”. Whether the names of Wellington and Waterloo resonate in the same way in the twenty first century, their legacy is still very much in evidence today in the towns and cities of the UK and further afield. Starting on 5 June 2017 there will be a re-run of the free Massive Open Online Course (MOOC) on the Duke of Wellington and the battle of Waterloo. Over three weeks, the course will cover events from the French Revolution to the decisive battle that finally defeated Napoleon, the significance of the conflict, the ways in which it changed Europe forever and how the battle and its heroes have been commemorated. Chris Woolgar and Karen Robson will use the Wellington Archive at the University of Southampton to provide an insight into these momentous events from the early nineteenth century. In conjunction with the MOOC, the Special Collections will be holding a Special Event on Saturday 17 June. This will feature a private view of the exhibition Wellington and Waterloo in the Special Collections Exhibition Gallery, a lecture on the Waterloo Despatch, followed by tea and dancing with the Duke of Wellington’s Dancers. This event it open to everyone. We would be delighted if you could join us! The Battle of Waterloo, fought on Sunday 18 June 1815, between allied forces and the French forces commanded by Napoleon, brought to a close more than two decades of conflict. Drawing heavily on the Wellington Archive at the University, this exhibition captures the final act of these wars from the perspective of the Duke of Wellington. It considers the diplomatic background to the military campaign of 1815, the battle itself, its aftermath and the occupation of France and the commemoration of both Wellington and Waterloo. It includes descriptions of the battle in the official reports of Wellington’s commanders, and a poignant letter from Wellington to Lord Aberdeen informing him of the death of his brother Sir Alexander Gordon, one of Wellington’s aides-de-camp. Amongst the items relating to the commemoration of Waterloo and Wellington are the catalogue of the Waterloo Museum, an establishment opened in the immediate aftermath of the battle, exhibiting memorabilia, and a nautilus shell, engraved by C.H.Wood, dating from the 1850s, which contains an image of Wellington on one side and St George on the other. The exhibition runs from 5 – 23 June during which time the gallery is open weekdays, 10am to 4pm. April 1814 saw the end game of the French Empire under Napoleon Bonaparte, with the abdication of the Emperor and the final military conflicts at Toulouse, Bayonne and Barcelona. After meeting with his military commanders on 4 April, who urged Napoleon to abdicate, he did so on 6 April. The allies then were faced with the question of what to do with him. They concluded that he needed to be deposed and sent into exile as they feared that any attempt to overthrow him would risk civil war. As Lord Liverpool, the British Prime Minister noted ‘any peace with Buonaparte will only be a state of preparation for renewed hostilities’. Signed by the allies on 11 April 1814, the Treaty of Fontainebleau set out the conditions of Napoleon’s abdication. In return for his abdication as Emperor of the French, Napoleon was granted the title of Emperor, given the sovereignty of the island of Elba, off the coast of Italy, and granted an annual pension of 2 million francs from the French government. 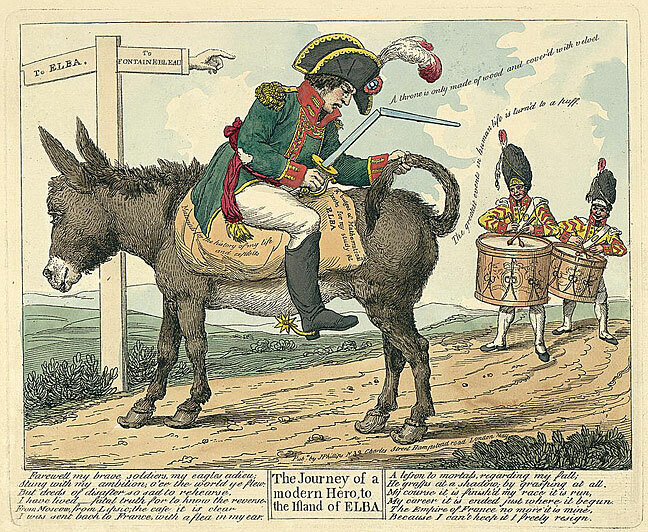 Cartoon, ‘The journey of a modern hero, to the island of Elba’, by J. Phillips. 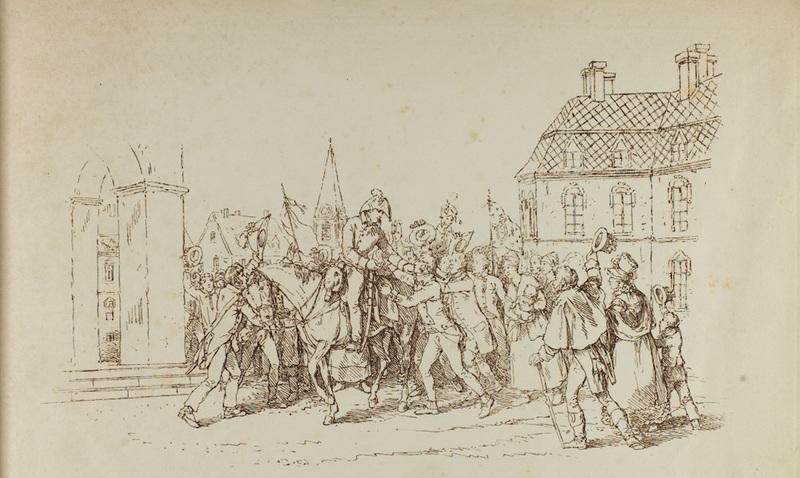 This cartoon, by J. Phillips, was published in May 1814, and shows the disgraced emperor riding backwards on a donkey, a typical pose of humiliation, with his sword broken. The poem makes much of the immorality and consequences of his ambition. Farewell my brave soldiers, my eagles adieu; Stung with my ambition, o’er the world ye flew; But deeds of disaster so sad to rehearse, I have lived — fatal truth for to know the reverse. From Moscow. from Lipsic; the case it is clear I was sent back to France with a flea in my ear. A lesson to mortals, regarding my fall; He grasps at a shadow; by grasping at all. My course it is finish’d my race it is run, My career it is ended just where it begun. The Empire of France no more it is mine, Because I can’t keep it I freely resign. Whist the details of the abdication of Napoleon were being finalised in Paris, in the South of France and northern Spain the war continued. News had started to filter through of the defeat of Napoleon at Arcis-sur-Aube and that the House of Bourbon had been proclaimed at Paris, but until these reports were confirmed neither Marshal Soult, the commander of the French forces, nor Wellington as commander of the allied army, could think of suspending their operations. Thus on Easter Sunday, 10 April 1814, the allied forces attacked Soult’s forces holding Toulouse. Although there were subsequent actions at Bayonne on the 14th and Barcelona on the 16th, Toulouse marked the last major battle between the main allied and French armies before the final end of the war. The battle of Toulouse was to inflict heavy losses on the allied forces, with around 4,500 killed. The French retained control of the northern part of the Heights of Calvinet, but recognising that his position as untenable, and concerned that enemy cavalry was moving to cut him off, Soult decided to retreat to Carcassonne and left the city of Toulouse on the 11 April. Jubilant inhabitants invited Wellington to enter the city the following day, where he received news of the abdication of Napoleon that afternoon. Wellington and Napoleon never faced each other on the battlefield throughout the years of the Napoleonic wars. This was to change in 1815, when they met for the first and only time at the Battle of Waterloo on 18 June. A MOOC on the Duke of Wellington and the battle of Waterloo, drawing on the Wellington archive at Southampton, and led by Karen Robson, Head of Archives, and Professor Chris Woolgar of the School of Humanities, will be given a re-run from 5 June 2017. Further details of this three week course will be available shortly. We hope that you can join us on 17 June. These sketches are part of a series drawn by Robert Hills a few weeks after the battle. Note the slightly sensational captions which he has added to the scenes! The Hill sketches were published in the Christmas 1945 edition of The Illustrated London News. A copy can be found in MS 300, the Peninsular War papers of Stephen George Peregrine Ward, military historian. These were donated to the University of Southampton along with his notable Peninsular War library. It is no coincidence that there was renewed interest in the study of the Napoleonic Wars in the post-WWII era: Mr Ward had served in Western Command during the Second World War, during which time he was introduced to the administrative problems of running a general staff and to the Murray papers in the National Library of Scotland. This, together with the acquisition of many of the Peninsular War items from the library of Sir Charles Oman, c. 1946, was the genesis of Ward’s work on the Peninsula, leading to his Oxford B.Litt. thesis, published as Wellington’s headquarters: a study of the administrative problems in the Peninsula, 1809-1814 (Oxford, 1957) and Wellington, (London, 1963). We have recently catalogued an additional deposit of S.G.P. Ward’s papers held in the Special Collections at the University of Southampton. MS 300 A4011 includes a copy of his B.Litt. thesis and a number of his publications, articles and lectures. Ward was working on a biography of Major General Sir George Murray, Wellington’s Quartermaster General in the Peninsula. The work remained unfinished at his death, but Ward’s typescript draft – which includes complete chapters – as well as many of his research notes, form a valuable resource for historians. An acknowledged expert, Ward wrote the Oxford D.N.B. entry for Sir George Murray – which is current today. Another useful part of this collection is the large number of photographic prints of portraits and paintings – both of Murray and his family, as well as of generals and military figures of different nationalities – from the Napoleonic period. 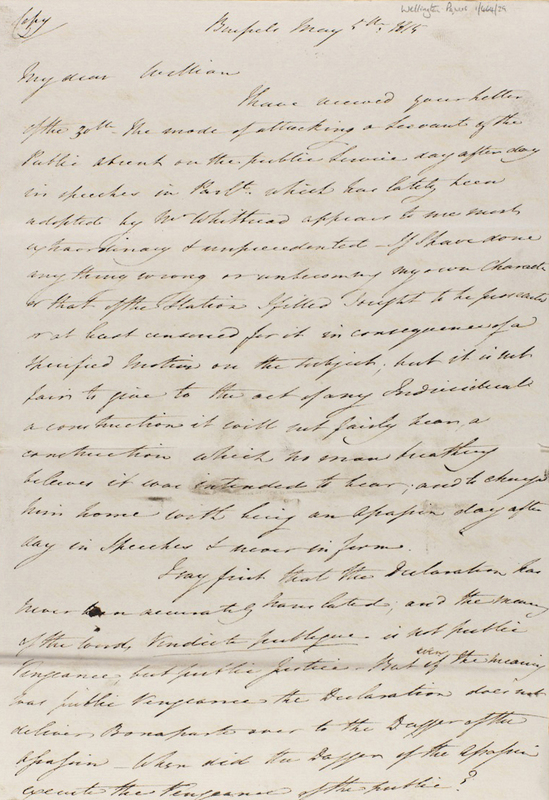 Ward acquired original manuscript material as well as copies and transcripts of archive sources relating to the Peninsular War. An unusual example is the Commissariat papers of Henry Whitmarsh c. 1812-14, (MS 351/7 A4237). These shed light on the logistical problems involved in moving large numbers of cattle between army depots in the Iberian Peninsula – essential for the maintenance of Wellington’s army. We learn that Henry had expected promotion, but was disappointed, and he complains that many gentlemen were obliged to return to England for their promotion. To find out more, why not visit the Archives and Manuscripts to view the manuscript collections. 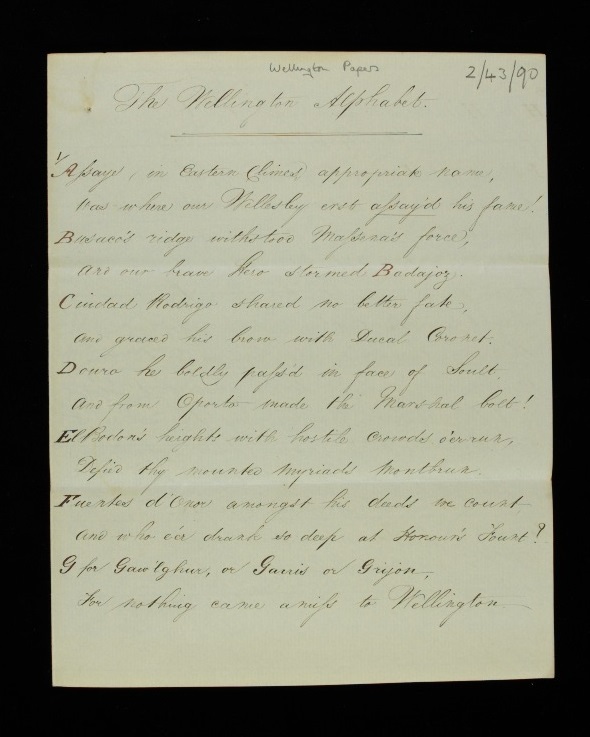 The Special Collections holds a manuscript copy, in the hand of Jane Austen, of Lord Byron’s poem “Napoleon’s Farewell”, c.1815: a dramatic monologue in three stanzas in the character of Bonaparte. Byron’s poem, likely written on 25 July, was first published in The Examiner on 30 July 1815 and subsequently appeared in his Poems (1816) where it formed part of a group of poems “From the French” which ranged between condemning Napoleon and praising his bravery. For Byron, Napoleon was the epitome of the Romantic hero, the persecuted, lonely, and flawed genius and it is believed he considered Napoleon a foil for his own complex personality. Jane Austen shared a fascination with Napoleon and even contemplated writing his history. In the spring of 1816 Byron left England in a cloud of scandal and debt, never to return. As he journeyed to Switzerland he visited the field of Waterloo as a tourist. Unlike many of his contemporaries, Byron saw the outcome of the battle as a tragedy rather than a victory and it was to have a significant influence on the third canto of Childe Harold’s Pilgrimage. Austen’s version of “Napoleon’s Farewell”, which differs from Byron’s original, seems to have been written from memory, and was produced in 1815 or 1816 while she was writing Persuasion. References to contemporary literature in Persuasion include those to the poetry of Byron. Some changes are small, for example, she switches “name” and “fame” at the ends of the second and fourth lines. Interestingly, in Byron’s original, Napoleon bids farewell to the land where, not the “bloom”, as penned by Austen, but the “gloom” of his glory rose. The third stanza contains the most differences. Napoleon asks to be remembered again in France when “Liberty” – rather than victory – rallies and he does not “vanquish the foes” but rather “baffle[s] the hosts” that surround them. The most significant difference is the third line from the end: the line in Byron’s original is “And yet may thy heart leap awake to my voice”. The brightest or blackest is filled with my name. The last single captive, to millions in war. Decayed in thy glory and sunk in thy worth. Tho wither’d – thy tears will unfold it again. Once more shall they heartless awake to my voice. Then turn thee and call on the chief of thy choice. While the military convention at St Cloud on 3 July brought a formal cessation of hostilities, there remained much to be done if France was to have peace. In particular, decisions still needed to be made regarding the establishment of a credible authority and the fate of Napoleon. Given that the Bourbons had not managed to establish themselves authoritatively in 1814-15, there was reluctance among the Allied powers to see Louis XVIII restored to the throne of France. However, no credible alternative could be found and, on 8 July, Louis XVIII made his formal return to Paris, the day after the arrival of General Graf von Zieten’s Prussian corps. The return of the King to the capital marked the end of the period that has become known as the Hundred Days (actually a period of 111 days), which began with Napoleon’s arrival into Paris on 20 March. Immediately after his arrival, the King assigned Lieutenant General Dessolles to command the national guard and Lieutenant General Maison to the command of the First Division of the army. A government was announced which was to be headed by Prince Talleyrand, who was also given the role of foreign minister. It was critical at this time for the King to have a strong government and ensure his authority was accepted. Furthermore, an army of occupation, under the Duke of Wellington, was established to support long term security while decisions were made regarding the boundaries of France and the settlement of war debts. If the hope of oblivion for Napoleon was misplaced, the solution did in general meet the Allies’ requirements for the duration of Napoleon’s life — although there was long-running conflict between the former emperor and Hudson Lowe, the governor of the island. Napoleon died on St Helena six years later, on 5 May 1821. In this week’s blog post Professor Emma Clery of the Faculty of English discusses an unsung hero of the war with Napoleon. In all the buzz surrounding the bicentenary of the defeat of Napoleon at Waterloo, no mention has been made of the existence of a peace movement in Britain during the long years of war with France. For several years I’ve been exploring the context of the great anti-war poem Eighteen Hundred and Eleven by Anna Letitia Barbauld, a writer well-known in her day. Before I began this research, I confess I wondered what the objection to the war could be, other than moral opposition to all warfare. Napoleon was generally seen by the British as a tyrant with an insatiable appetite for conquest, who must be resisted, right? But no. There was organised opposition to the war, and a lot of the leadership came from well-educated, prosperous and socially respectable Dissenters, many of them Unitarians like Barbauld. Their arguments were moral and religious, but also pragmatic, economic and political. They judged that Napoleon’s desire for war with Britain had been exaggerated, and condemned the unwillingness of government to listen to diplomatic approaches from France and her allies. They pointed out that ministers and officials were profiting from the war, and had an interest in prolonging it. At various points in the period 1793 to 1815 they saw opportunities for an honourable negotiated peace with Napoleon and launched nation-wide petition campaigns to put pressure on the war establishment. The peace of Amiens, which lasted for 18 months from 1802-1803, had been very popular. In the years 1808 and 1812 in particular, there seemed to be an opening for new peace negotiations. During the war years the Whig party, the official opposition in Parliament, was lacking in direction and effectiveness. Their policy on the war wavered. Their long-standing leader Charles James Fox favoured peace, but he only gained power briefly during a coalition government immediately before his death in 1806, and no progress was made. His successors, Lord Holland and Earl Grey, gradually came round to luke-warm backing for the war. The anti-war cause was instead taken up in the House of Commons by radical Whigs, first among them Samuel Whitbread. He was brother-in-law to Grey, but came from a non-aristocratic background. He was the son of a wealthy brewer, and was never allowed to forget these lowly origins in trade by political opponents and by satirists. Everyone has heard of Nelson and Wellington, but Whitbread is an unsung hero of the war with France. There’s been no proper assessment of this prominent figure on the British political scene since Dean Rapp’s 1970 PhD thesis was published as a book in 1987. I stumbled upon Whitbread’s speeches and activities almost by accident, and it struck me that there was something truly heroic about his dauntless championing of a variety of apparently lost causes, but especially his consistent support for the cause of negotiated peace. There is also something poignant about his death less than three weeks after Waterloo. I didn’t want this anniversary to pass without suggesting a couple of avenues for re-evaluation. Although Whitbread represented a significant and influential tranche of public opinion at the time, he was marginalised by political opponents and even by members of his own party, and his predictions of disaster were mocked in the Loyalist press. This kind of belittling treatment has continued to the present day, with supposedly objective reference sources like Charles Arnold-Baker’s The Companion to British History and the article by D.R. Fisher on Whitbread in the Oxford Dictionary of National Biography in fact launching bizarre personal attacks on him. This rubbishing of Whitbread goes hand in hand with an uncritical acceptance that the war against Napoleon was unavoidable and British victory was inevitable. Another point arises from Roger Knight’s recent Britain Against Napoleon: The Organization of Victory 1793-1815. The title may seem teleological, as if victory was a foregone conclusion. But actually the conclusions are far more circumspect. Knight goes so far as to argue that possibly the greatest advantage Britain enjoyed seemed to be a weakness: its parliamentary system of government. Napoleon could impose his will without opposition, but, Knight says, ‘while Napoleon had the advantages of continuity and speed of decision, he eventually lost a sense of reality’ (p. 464). The logical consequence of Knight’s argument is that the energetic radical wing of the Whig opposition, the Mountain led by Samuel Whitbread, inadvertently helped in this process of honing the government into a mean and lean fighting machine. By this token even the most hawkish can join in celebrating Whitbread’s contribution. …I do not know how to rejoice at this victory, splendid as it is, over Buonaparte, when I consider the horrible waste of life, the mass of misery, which such gigantic combats must occasion. J.E. Cookson, The Friends of Peace: Anti-War Liberalism in England 1793-1815 (Cambridge: Cambridge University Press, 1982). Roger Fulford, Samuel Whitbread, 1764-1815: A Study in Opposition (London, Macmillan, 1967). William McCarthy, Anna Letitia Barbauld: Voice of the Enlightenment (Baltimore: Johns Hopkins University Press, 2008). Dean Rapp, Samuel Whitbread (1764-1815): A Social and Political Study (New York and London: Garland Publishing, 1987. As June faded into July, the Allies refused to agree to an armistice, determined to take control of France and to re-establish a legitimate government that would afford some chance of peace. Napoleon may have fled Paris for the coast, hoping to reach America, but his supporters were still at large; the Allies advanced, taking the fortresses of the towns along the border, and marching after the remnants of the French army, as it retreated to Paris. “The enemy attacked the advanced guard of Marshall Prince Blucher’s corps at Villers Cotterets on the 28th, but, the main body coming up, they were driven off with the loss of 6 pieces of cannon and about one thousand prisoners. It appears that these troops were on the march from Soissons to Paris; and, having been driven off that road by the Prussian troops at Villers Cotterets, they got upon that of Meaux. They were attacked again upon this road by General Bulow, who took from them 500 prisoners, and drove them across the Marne. They have, however, got into Paris. The advanced guard of the Allied army under my command crossed the Oise on the 29th, and the whole on the 30th, and we yesterday took up a position, with the right upon the height of Richebourg, the left upon the Bois de Bondy. Field Marshall Prince Blucher, having taken the village of Aubevilliers, or Vertus, on the morning of the 30th June, moved to his right, and crossed the Seine at St. Germain’s as I advanced; and he will this day have his right at Plessis Piquet, his left at St. Cloud, and the reserve at Versailles. The enemy have fortified the heights of Montmartre and the town of St. Denis strongly; and, by means of the little rivers, Rouillon and la Vieille Mer, they have inundated the ground on the north side of that town; and water having been introduced into the canal de l’Ourcq, and the bank formed into a parapet and batteries, they have a strong position on this side of Paris. The heights of Belleville are likewise strongly fortified, but I am not aware that any defensive works have been thrown up on the left of the Seine. Having collected in Paris all the troops remaining after the battle of the 18th and all the depots of the whole army it is supposed the enemy have there about 40 or 50,000 troops of the line and guards, besides the National Guards, a new levy called les tirailleurs de la garde, and the Federes. The Allies were reluctant to destroy Paris, the capital of Louis XVIII, whom they hoped to restore to the French throne. Yet the French army could not be allowed to remain there, and the king could not recover his throne in a way that left him in the hands of the Assemblies, which were seen as Napoleon’s creation and instrument. Fighting continued around Paris on 2 and 3 July, at Meudon and Issy, to the south-west of the capital, in which the French suffered heavy losses. The Prussians then moved along the left bank of the Seine, in communication with Wellington’s army by way of the bridge at Argenteuil; and the British army was able to move in force along the left bank of the Seine as well, towards the Pont de Neuilly. At this point, the French asked for a ceasefire on both sides of the Seine and to negotiate a military convention. Agreed at St Cloud on the night of 3 July and ratified the following day, the convention set out the terms on which the French army should evacuate Paris. There was to be a suspension of hostilities, with the French army given eight days to withdraw from the city across the Loire. In return, the Allies promised to respect the rights and property of the present authorities, French citizens and members of the French armed forces. At this stage, the terms of the agreement remained purely military and did not settle any political question. Following his defeat at Waterloo, Napoleon chose to return to Paris on the afternoon of 21 June, instead of remaining on the battlefield with his shattered army. On his return he found that he was no longer supported by either the legislature or the people. The following day, 22 June, he abdicated in favour of his son Napoleon II, who was four years old. The newly established Provisional Government proclaimed this fact to the French nation and the world and sent ministers to the Allied Powers to treat for peace. On 15 June Napoleon and his forces crossed the border into the Low Countries. Napoleon knew that he did not have a large enough army to defeat the combined Anglo-Allied and Prussian armies, so he attacked the Prussian force at the lightly garrisoned post of Charleroi. This post had been identified by Napoleon as a weak point between the allied armies and by attacking it he hoped to potentially divide the two sides. Lieutenant General Zieten, who commanded at Charleroi, had been ordered not to attempt a serious defence of his position, and evacuated. Following the attack, Prussian forces began to move between Charleloi and Ligny and were in place by the afternoon of 16 June. The Anglo-Allied army was ordered by Wellington to concentrate its forces at Quatre Bras. The Battle of Ligny, which began at 3 o’clock on the 16th June was an intense battle between the Prussians and the French under the command of Napoleon. Although Marshal Ney was not able to provide assistance, as he was engaged in battle elsewhere at Quatre Bras, the French forces prevailed. At the end of the day with their reserves exhausted, the Prussians retreated, moving towards Wavre. At the same time as the Battle of Ligny, another battle was being fought at Quatre Bras. Here the Anglo-Allied army faced that of Marshal Ney. The momentum of this battle swung back and forth as the arrival of fresh troops gave one side or the other the advantage. Eventually the advantage swung in Wellington’s favour and he gained a modest victory as Ney’s forces were repulsed. Learning of the Prussians’ defeat, and of their retreat towards Wavre, Wellington pulled his forces back to around Mont St Jean, which was about ten miles west of Wavre. Having received assurances from the Prussians that they would come to his aid, Wellington determined to give battle on the 18th June from this position. The Battle of Waterloo commenced at 11a.m. 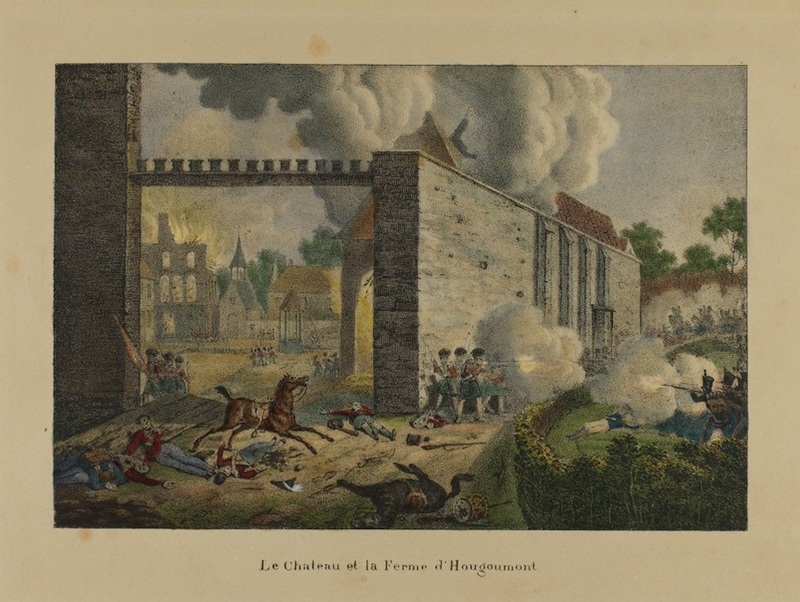 on 18th June with an attack by Napoleon against the château of Hougoumont. The opposing forces commanded by Wellington and Napoleon were fairly equal in number — nearly 75,000 each — however, Wellington was hampered by the variable quality of the coalition forces under his command and was considerably outgunned. Another 30,000 French troops, under the command of Marshal Grouchy, were based to the east and this force engaged part of the Prussian army at Wavre as the Prussian forces made their way to Waterloo. Some of the Prussian army were not to see action at Waterloo as they were still on their way when the battle ended, but Field Marshal Blücher with forces of around 12,000 infantry and 3,000 cavalry, reached the Battle of Waterloo at a crucial point in the afternoon. “I yesterday after a most severe and bloody contest gained a complete victory, and pursued the French till after dark. They are in complete confusion and I have, I believe, 150 pieces of cannon; and Blucher who continued to the pursuit all night, my soldiers being tired to death, sent me word this morning that he had got 60 more.